I’m writing this week’s column at what I sincerely hope is the tail end of what the local Cleveland newscasters having been calling a “Snowmageddon.” For some reason, the inclement weather has combined with some sort of cold/flu/plague bug to give me a craving for old abominable snowman movies. I watched The Snow Creature (1954) and The Abominable Snowman (1957) back to back. I would tell you these two films are unrecognized cinematic classics, but not even below zero wind chills can numb my mind to that extent. Fortunately, I also had some pretty good comics to ease my misery. From the streets of Harlem to the depths of the ocean with a side trip to Metropolis, the three books I’m reviewing this week helped keep my mind off my physical ailments and the snow piles towering over me when I walked to get the mail or my daily newspapers. Even a Snowmageddon can have an upside. I only met legendary author and comics writer Alvin Schwartz once. It was at one of Roger Price’s Mid-Ohio-Con events. By the end of our first conversation, Alvin and I had bonded. Though I never saw my friend again, we called each other on the phone and we exchanged e-mails. He was an inspiration to me. His novels on the concept of the tulpa (a being or object which is created through spiritual or mental powers) gave me a new way of looking at the characters I had created and why they seemed so real to me. 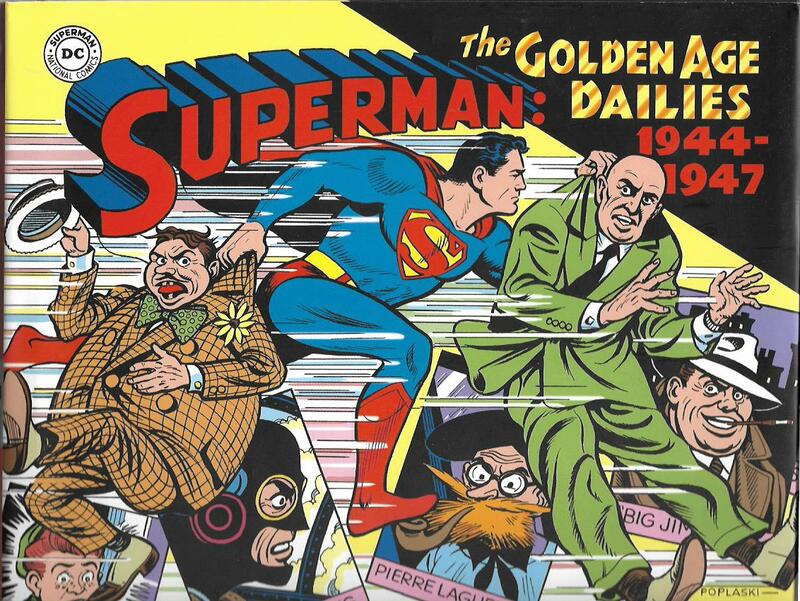 Superman: The Golden Age Dailies: 1944-1947 [IDW; $49.99] collects the Man of Steel’s daily adventures from October 30, 1944 to April 26, 1947. Schwartz wrote these stories, the equally legendary Wayne Boring drew them and Dean Mullaney lovingly presents them in this glorious hardcover book from The Library of American Comics. It’s a fascinating, fun visit to a past era of one of the most beloved characters in fiction. These stories could be classified as situation comedies of a sort. A con man is mistakenly revealed to be Superman. Lois Lane is set to inherit millions if she gets married. Invisible creatures make Superman’s life maddening, as does the somewhat more visible Mister Mxyztplk. A young man’s future is nearly ruined because a professor doesn’t believe in Superman’s powers. There are some more serious tales in the mix, such as one on juvenile delinquency, but, for the most part, these are breezy entertainments, perfectly suitable for all readers. Schwartz’s dialogue is always clever. Boring’s art is both iconic and warmly inviting. The production of this book is as much a work of art as the actual comic strips. It is a thing of joy and my top pick of the week. This is a wild one. Inspired by the movie Voyage to the Bottom of the Sea , Dell Comics published Voyage to the Deep, a nigh-psychedelic, title featuring the adventures of the nuclear super-submarine S.S.N. Proteus. In each of the four issues of the title, Admiral Jonathan Leigh and his crew were called upon to battle “the Enemy,” a mysterious adversary seemingly bent on eradicating all life on Earth. 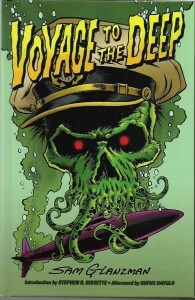 Voyage to the Deep [It’s Alive/IDW; $24.99] has lovingly gathered all four issues of the title. Drawn by the legendary Sam Glanzman, whose World War II service in the United States Navy informed his incredible work on hundreds of comics, the first three issue-length stories were very likely written by Lionel Ziprin, a Kabbalist and poet who lived on the Lower East Side of Manhattan and is known to have written issues of Kona Monarch of Monster Isle and scripts for some of Dell’s war comics. The fourth issue has been attributed to the prolific Paul S. Newman. No world-destroying scheme was too diabolic for the Enemy. It tried to destroy the Earth by flood, by ice, by anti-matter and by fire. Each time, Admiral Leigh would devise outlandish methods by which his submarine could foil the attacks. In most issues, salvation was preceded by manic imaginings of what humanity would suffer if the Enemy succeeded. Glanzman excelled at such disastrous drawings and Ziprin’s prose made the predictive art even more fearsome. Sidebar. I was so taken by Ziprin’s writing I went to eBay to buy a comics adaptation of the TV series Adventures in Paradise [1959-1962] on the possibility he wrote the issue. I’ll write about it in the near future. If the comics themselves weren’t reason enough to buy this handsome hardcover collection, the additional features seal the deal. Comics creator and historian Stephen R. Bissette’s introduction gives us a insightful look at submarines in fantasy fiction and their use in comic books during the Cold War. Additionally, there are galleries for the Voyage to the Deep covers, inside covers and back covers; an afterword by artist Rufus Dayglo, and biographies of Glanzman, Bissette and Dayglo. Collection editor Drew Ford should be proud of this volume. It’s wonderful! 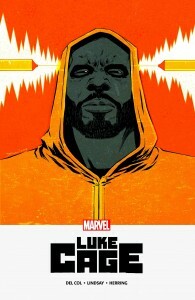 Luke Cage: Everyman [Marvel; $19.99] collects the digital series by writer Anthony Del Col and artist Jahnoy Lindsay. I enjoy Marvel’s print versions of such digital series because the comics tend to be complete unto themselves with interesting premises and satisfying endings. With the ongoing series, it sometimes seems like stories never really end. They just lurch clumsily into a continuation of the same old stories. Harlem is suffering from a life-threatening heat wave as the story opens. The mysterious “Everyman” purports to be the champion of the people, murdering the powerful and wealthy deemed to have committed crimes against the people. The victims die swiftly from diseases that come out of nowhere. Hired to guard a client targeted by Everyman, Luke is also dealing with his own medical situation. He has been diagnosed with Chronic Traumatic Encephalopathy (CTE). His skin might be invulnerable, but his brain is showing the effects of the hits he’s taken during his career as a hero for hire. Del Col does a good job writing Luke. We get some great scenes of Luke with his daughter Danielle. We get some emotional moments of Luke realizing what his disease likely means for his relationship with her and others he loves. I think some of our best super-hero stories contrast the fantastic with the real world. Luke Cage: Everyman is a solid story with good art. The inclusion of Omega Red was a minus for me. Of late, I am increasingly bored with all things X-Men. But that won’t prevent me from recommending this trade paperback to you. The more quality Luke Cage comics we get, the happier I am.